Back at IFA in Berlin this past September, Google off a feature in Translate which truly illustrated the potential of their technology. By enabling conversation mode you can easily communicate with someone who speaks a completely different language than you! It's as simple as opening it up, selecting the two languages and talking into the phone one by one. 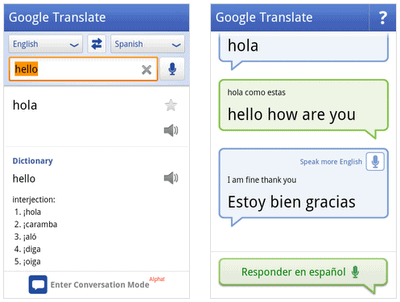 Google Translate 2.0.0 is now available at the Android Market. I tried out the update as soon as it came out and it works wonderfully. With voice input in 15 languages and 53 total languages supported, almost anyone can benefit from it. Check it out by scanning the QR code below or via Appbrain.